We’re excited to announce the completion of the upgraded village park walking path (1st Phase)! The new path is made of self binding, compacting material that provides a more natural and firmer finish. Folks of every age use the path to keep fit and get out for a relaxing walk in the park making this part of the park renovation one of the most anticipated upgrades. Happy to check this one off the master plan renovation to-do list! 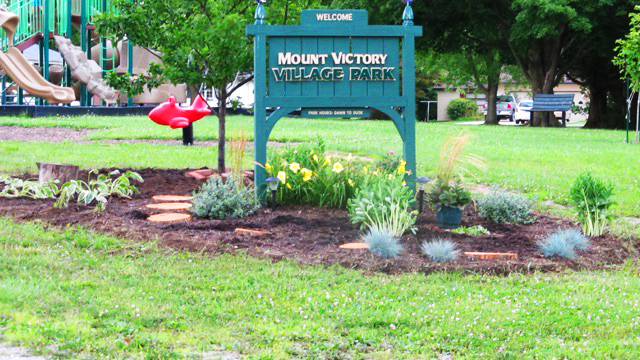 Get outdoors and enjoy your new village park walking path! 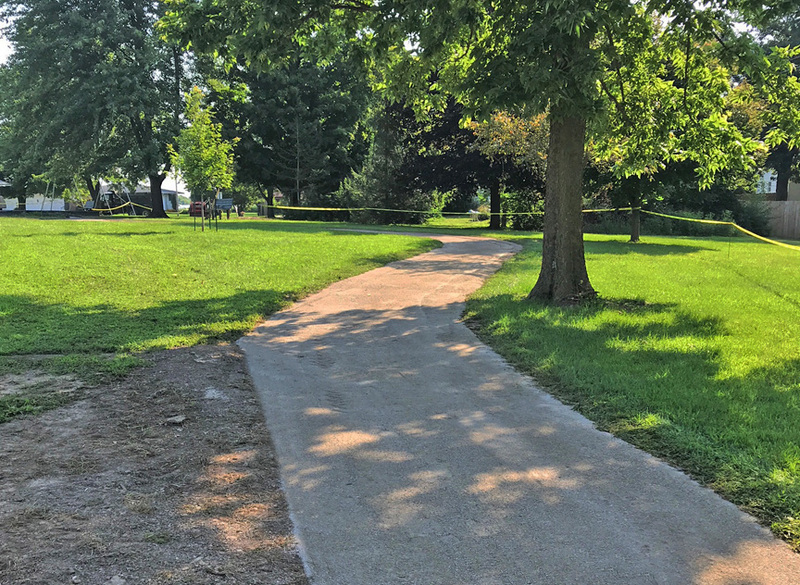 Special thank-you to all people, businesses, and grantors who have helped fund the walking path and the other upgrades at the park the past few years – give yourself a pat on the back because CIC Friends of the Park could not do it without your support! Anyone can still donate to the park renovations here: http://bit.ly/2Maz5l9 – ANY amount is greatly appreciated! The concession stand renovation has been completed and looking good! 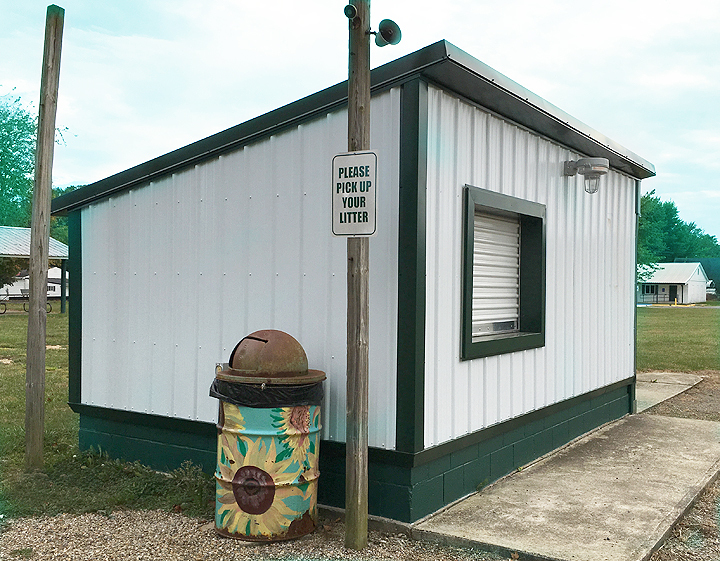 The concession stand make-over included new roof, new siding, new security doors, new secure metal roll up concession stand window, repair and paint foundation. A snazzy new baseball graphic may be added to the front as well. This has been a long time coming and MVCIC would like to thank those who donated and grantors who helped fund this important update to the Mt. Victory Village Park. In addition – the toddler area table has been installed plus new donor bricks are in and ready to install. Remember, it’s not too late to get your DONOR BRICK! Fundraising from the bricks go toward making upgrades to your park! Next Up: The bleachers are the next feature to be upgraded in the park THIS FALL. All new treated wood will replace the older warped boards, the cinder block bleacher supports will be repaired and painted and ready for fans to cheer on their favorite players in 2018! Also work will be starting on the double slide for the preschool play area soon. Tunnel under the slide has been ordered. It’s 20′ long so if anyone has a flatbed trailer, help transporting it from Marion to Mt. Victory would be greatly appreciated! Call 614-579-1013 if you can help. Lots of activity in the village park this summer! Thanks to all of the donors who gave cuts of perennials, the landscape mat, and volunteers who painted the posts where the birds love to roost. Hardin Co. Community Fdn. granted the money for the mulch in the play area and in the landscaping (240 bags) and around the entrance sign. Mt. Victory CIC wrote the grants and provided the manpower and the remaining expense for this beautification project. Soon to come is a cement slab (Hardin Co. Com. Fdn) and a play table to be placed near the Sandy Parthemore tree. Take a walk through this area to see names of the plants, enjoy the play table and preschool play area and experience the little path made from donated osage orange discs. (Note: There are two solar lights near the sign.) Later in the season, the preschool play area will be getting the addition of a big hill that will need the winter to settle. In the spring, the two slides that we have will be erected on each side of the hill and we will landscape with ornamental grasses. Of course, we would love to have some help on this big project. This will finish the PreSchool area and then we will move on to developing the new walking path. We hope to start Phase I of the walking path from the park entrance through the playground. It will be an infinity path as the beginning the rest of the area that will include the tennis court area. Watch for the remodeling of the concession stand this month (July/Aug). CIC has contracted with a carpenter who will do the construction upgrades as planned. This work is funded by CIC through donations & fundraising. The baseball group, RYSSA, that keeps baseball games going in the park is in need of a small freezer and a counter top. If you would like to donate these items, they would be ecstatic (contact them on Facebook »). The concession stand will have new exterior finish, new service window, steel security doors with new locking systems and security cameras. Future plans are to help with two new dugouts, replace the bench boards on both sides of the concession stand and complete the walking path. We are try hard to follow everything residents in the community put into the original master plan including a putting green! Slow but steady the park renovations are coming along thanks to grants and donations large and small from Mt. Victory residents and businesses who care and use the park! 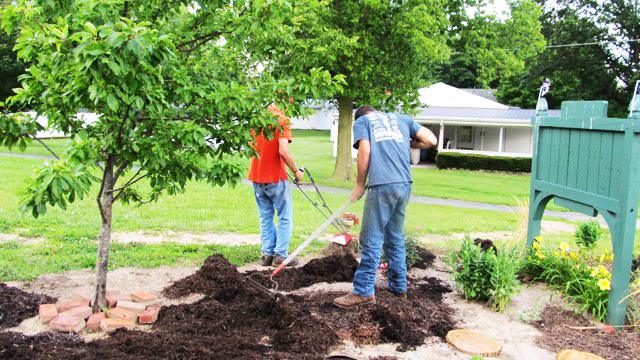 – Call 937-354-3334 to donate funds, flowers, plants, supplies and/or labor.